What do we owe publishers and authors? I think that there should be a mutual respect between book bloggers and the authors/publishers. Accountability is important, so when you say you will do something, you had better do it. That being said, we do this for free because we love books. We aren't employed by the publishers, so I don't think they have too much of a right to demand anything. Yeah, maybe if you want to get those "free" books, you have to jump through their hoops, but honestly, if the publishers are demanding things, then I think it is time to take a step back and decided whether it is really worth it. Until the publishers start paying bloggers, it is a hobby even if some of us treat it like a 2nd or 3rd job, so I just don't think they should have the right to demand much of anything. If we accept ARC’s do we “owe” anything to them or just an honest review to our followers? This is always been a sticky situation for me, and it has only been in the last 6 months that I've been able to accept the fact that I'm just not going to be able or even willing to read everything that is sent to me. I used to slog through everything that arrived on my doorstep whether I liked it or not in fear that the publishers would stop sending the books I did want if I didn't. However, that got old really fast and caused a really bad case of blogger burn out. So now, if a book arrives unsolicited, I only read it if it interests me, otherwise I try and pass it on to another blogger/reader or donate it to my local library. Now, as for the books that I request, I make every effort to read and review them as I did commit to the publisher/author. (Getting back to the accountability issue here.) Of course sometimes even with the requested books, things will just not turn out how I hoped, and I have to decline to review it since I couldn't finish it. Although this happens so rarely on books that I have requested, that it hasn't been an issue. 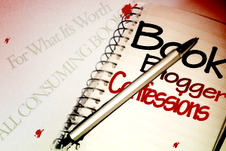 As book bloggers are we obligated to do more than just review books? Post covers – participate in book tours – host guest posts - promote authors? Again, I don't think bloggers are really obligated to do anything, even review books. I think everyone's site should be what they want it to be, letting their own personality shine. It's your blog, make it what you want it, not what you think it should be to be "acceptable."